I thought I would share our current chore chart so you can see some of the different chores my little people do. Our chore chart gets changed a few times a year. Seasonally outdoor work is added or taken away, as an example. 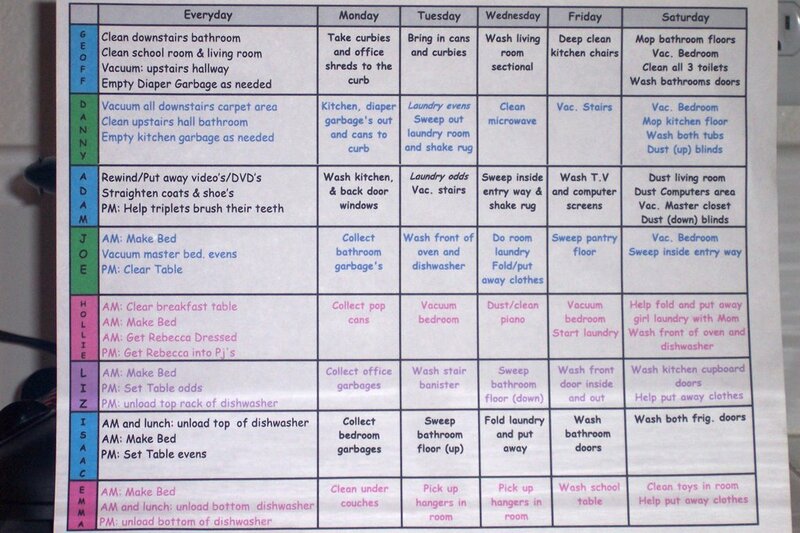 I have a seperate chart for kitchen chores and laundry days. 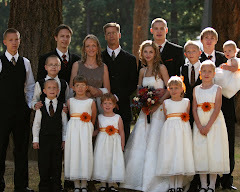 Starting at the top, by name, the ages of the children are: 17,14,11,9,8,6,6 and 4. 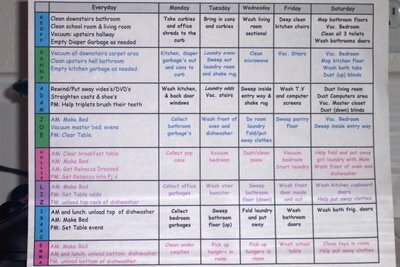 You will need to click on the picture of the chore chart to see it larger. One of the most important things I do, besides teaching the child how to do a chore, is set them up for success. What do I mean by this? For instance, with unloading the dishwasher I have the youngest child unload the bottom rack because it is lowest to the ground and generally doesn't have highly breakable items in it. I also store all my dishes in lower cupboards so that the children can easily reach them. I use Corelle plates for daily dishes, since they do not break very easily. When I do have a special item that is breakable or goes in a cupboard out of the child's reach, they know to put that item on the counter and I will put it away for them. A lot of people are surprised to find my plates and bowls in lower cupboards, but when I explain the reason for it they totally agree it is a great idea! I have set my kitchen up with little people in mind. Kitchen towels, bibs and wash cloths are also in the lowest drawers in the kitchen so my little laundry helper can put them away when she helps me with folding. You can use my kitchen example in every room of the house. Toys in the bedroom should be stored where the child can put them away. Clothing should go in drawers the child can reach. Books where the child can put them away. If a child can't reach a sink or washing machine, be sure to have a step stool they can use. Cleaning supplies for little people (we use a rag and water for the under 8 children) need to be where they can reach them. A dust pan with a matching small hand broom is great for little hands to sweep out small places. Continuing with my dishwasher example, once a younger child has graduated from the lower rack (graduation comes with age, skill and a younger sibling ready to take on the bottom rack), the child moves up to the top rack of the dishwasher. We do keep our cups, mugs and glassware in an upper cupboard. So, this child needs to be steady on a chair so they can stand on it to put away the cups, etc. Usually the sharp knives are in the upper rack also and so the child must be taught to put those away carefully. One last thing I will share in this post is what we call being a "padawan". This is a Star Wars Jedi term that we have found suits the time in a child's life when he works side by side with an older, experienced sibling, learning a new, more difficult chore. We have used it at different times with different children. At first the "master/teacher" does the chore in front of the padawan (younger child) every time it is done, progressing to having the padawan help with the chore and eventually the padawan does the whole chore while the master/teacher sibling watches. Once the older sibling lets me know his/her padawan is competent, I rearrange the chore chart and the padawan is now on their own with this new chore. This has worked great for having the older children teach the younger ones how to clean the bathroom, set the table, do dishes, etc. I also team up younger children on tough jobs, like kitchen chores. Right now my 8 and 9 year old work together two mornings a week to do the breakfast kitchen. We do kitchen clean up and wash dishes at every meal (big family, remember?). Setting and clearing of the table are done separately from the person who has "kitchen" chore. Kitchen chore includes: loading dishwasher and washing by hand anything that does not fit in the dishwasher, washing sink and counters, stove top, table, chairs and sweeping the kitchen and dining rooms. Three times a day. Gavin loved the padawan idea! I think an unspoken key to your home management system is that you (and your dh) are self-disciplined and able to model that quality for your children. I want to develop that quality in my own life. It must be sadly lacking because I am having a hard time modeling it for my children! Hugs. Thanks for sharing your time with us! This blog is an incredible blessing. a couple of years ago I really did not know how this was done (having kids and a clean house), and had never seen the information- so to see someone else organize their time and family responsibilities like this is SUCH A HELP to someone who wants learn! Thankyou so much! Thank you for all your wonderful feedback. It really helps me to know if what I am writing is actually helping anyone out there or am I way off base! LOL! You know, I can watch the site meter go up and up, but if there aren't any comments left I can only wonder.... lol. So, thanks for taking that extra couple of minutes to leave a comment! This has been an incredible encouragment and inspiration to me! This is great Jerri, I love it! I just started reading a great book by Teri and Steve Maxwell called Managers of Their Chores, it's has totally changed how I veiw chores! Thanks too for your suggestions, they are so encouraging! Wow - I love this series of your thoughts!!!! Empowering children, while teaching responsibility and discipline are sooooo important, and so glossed over in our culture! Did you create your task chart on computer? If so, would you mind sending me a copy? I love this post! 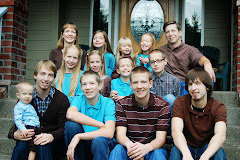 Let me pick my jaw off of the floor - 12 children!!?? I can't imagine!! But it seems you are managing it well, KUDOS to you, you totally deserve it!! I'm off to find part 3 now! I found your site from Rocks in my Dryer... love these two posts about chores for little people! My twin boys just turned one so soon enough we will be able to implement some of your ideas!